Ten-year Treasury yields jumped 11 bps this week to 2.66%, moving decisively above the key 2.60% technical level - to the highest yields since July 2014. Two-year yields ended the week up seven bps to 2.07%, the high going back to September 2008. Five-year Treasury yields jumped 10 bps to 2.45%, the high since April 2010. Has the long-delayed bond bear market finally commenced – with barely a whimper? Markets fretted over a potential spike in yields over recent years. I suppose You Can Only Worry For So Long. The S&P500 has gained 5.1% in three weeks. If this return is lacking, one could have made 6.5% in the Dow Transports, 6.9% in the Nasdaq100, 6.8% in the Nasdaq Composite, 7.0% in the KBW Bank index or 9.5% in the Semiconductors (SOX) – all in the 2018’s first 13 trading sessions. With equities deep into parabolic melt-up, let’s not expect market participants to be all too fixated on Treasury yields at a mere 2.64%. Why worry over where market yields might be in a few months, not with huge gains to harvest on an almost daily basis in equities markets. No reason to worry about the ECB winding down QE later this year. No basis for fretting a few Fed rate increases spread over many months. Clearly, the Bank of Japan is in no hurry either. Government shutdown - no issue. With tax cuts achieved, gridlock is fine. Liquidity abounds – might abound forever. Meanwhile, the reality is that global bond markets could be ending a three-decade bull market that changed the world. Markets have grown comfortable with uncertainty. I would posit that markets have come to adore myriad uncertainties. After all, they ensure the certitude of interminable aggressive monetary stimulus. As the bullish thinking goes, it’s wasted energy to contemplate a spike in yields when, obviously, central banks won’t tolerate one. Waiting anxiously to perform another act of heroism, QE can be revived in an instant. Unless something dramatic transpires, global central bank balance sheet growth will slow significantly in 2018. At the same time, governments are geared up to issue more debt. Central banks accommodated years of (“counter-cyclical”) massive deficit spending, and now big deficits are the (structural) norm. Supply/demand dynamics will be shifting substantially, yet bond prices are expected to adjust slightly. The U.S. will be financing a huge fiscal deficit as the Fed pares back its balance sheet. Moreover, there’s an unusual degree of uncertainty surrounding future U.S. fiscal deficits. Tax cuts pay for themselves with bountiful prosperity, or perhaps this a replay of the late-nineties Bubble Mirage that had the U.S. paying off all its debt. There’s a scenario – a not outlandish one at that - where the Bubble bursts and deficits skyrocket toward $2.0 TN. For now, there is also the risk of trade battles coupled with a global economic boom and market Bubbles that create unusually uncertain inflation prospects. Extraordinary: The end of an unparalleled bull market that saw $14 trillion of experimental “money” printing, along with zero/negative rates, push global yields to historic lows, in the face of unprecedented government debt issuance and record corporate debt sales. There is as well the issue of unquantifiable speculative leverage and derivative exposures, along with a now enormous ETF complex untested in bear market dynamics. Reasons aplenty to take a cautious approach with long-term bonds globally. When it comes to uncertain 2018 prospects, China joins bond yields near the top of the list. Similar to their approach with bonds, equities buyers are today comfortable with China and feel no compunction to ponder beyond the present. Markets over recent years fretted over a Chinese financial accident. I suppose You Can Only Worry For So Long. Total Social Financing (TSF) dropped in December to a weaker-than-expected 1.140 TN yuan (estimates 1.500), or about $178 billion. This was down 30% from both November and from December 2016. The fourth quarter marked a significant slowdown in TSF. Quarterly growth in TSF averaged 5.216 TN yuan ($815bn) during the first three quarters of 2017, but then dropped to 3.795 TN yuan ($593bn) during Q4. For the year, growth in TSF (which excludes government borrowings) was 9.2% ahead of 2016 levels to 19.443 TN ($3.038 TN). Yet for the first three quarters of 2017 TSF was expanding at a rate 16.3% above comparable 2016. The fourth quarter actually saw the growth in TSF 12.7% below that of Q4 2016. Financial institution loans to Chinese households surged 21% in 2017, with lending remaining strong through year end. Lending to corporations slowed markedly last year, with December lending half of November’s level. Mortgage loans dominate Chinese household borrowings. And with housing prices inflated after years of easy finance, China is becoming increasingly susceptible to a self-reinforcing downturn in both apartment prices and mortgage Credit growth. China traditionally begins the year with blockbuster Credit growth. January lending data will provide some indication of whether the fourth quarter slowdown was chiefly seasonal or rather the beginning of a more determined effort by Beijing to rein in Credit excess. Chinese regulators this month toughened their crackdown on off-balance sheet “shadow” lending. Chinese exports were up 10.9% in December. China ran a $54.69 billion trade surplus in December, the largest since January 2016. Foreign reserves rose to a larger-than-expected $3.140 TN, the highest level in 16 months. Fourth quarter GDP was reported at a stronger-than-expected 6.8% - putting 2017 growth at an above target 6.9%. Chinese 10-year yields closed Friday at 3.98%, the high going back to October 2014. With the global economy humming along and global finance bubbling along, it’s not an inopportune time for Beijing to finally assume an assertive stance in reining in Credit. They will, of course, seek to avoid a shock. Beijing will, as well, focus on assuring productive Credit is readily available to sustain economic expansion. Productive enterprises should be supported, while speculative endeavors will be starved of finance. Easy to plan, not so straightforward to execute (Federal Reserve 1928/29). “Houses are built to be inhabited, not for speculation,” President Xi proclaimed back in October during the 19th Party Congress. The problem is that tens of millions of Chinese have made fortunes in real estate. Hundreds of millions more aspire to. Not only has housing become the epicenter of Chinese speculative excess, mortgage Credit has inflated to the point of becoming a majority of total Credit growth - as well as a prevailing source of finance for the real economy. It all evolved into a full-fledged mortgage Credit Bubble, surely an expanding black hole of malinvestment, fraud and bank losses. It’s curious to see Chinese housing transactions and prices plateau (in key markets) in the face of rampant mortgage Credit excess. Markets’ lack of concern notwithstanding, we can remind ourselves that this is China’s first mortgage boom – and a rather long and spectacular one at that. And I’m all too familiar with the view that Beijing is adept at managing oh so many things. Yet they’ve sure made a historic mess of mortgage finance – the extent of which will begin to surface as soon as lending slows. It’s one of history’s great ongoing manias, one that these days barely garners attention in The Age of Equities and Cryptocurrencies. At this point, it’s not clear how Beijing possibly succeeds in reining in housing speculation without bursting an epic apartment Bubble (makes bitcoin look so tiny). With global yields on the rise and Chinese regulators on the case, the Chinese apartment market could be a critical development to monitor in 2018. Hard for me to believe there’s not a black swan holed up in there somewhere. And that goes for global bond markets as well. What Does the End of The Liberal International Order Mean for Markets? The benefits of globalization have been unevenly distributed, and those who have been on the short end of the curve are pushing back. Given the dire situation millions of Americans are in today, I don’t wonder why they are doing so; I wonder what took them so long. According to a 2017 study by the Federal Reserve, 44% of Americans wouldn’t be able to cover an unexpected $400 expense without borrowing or selling something. Yes, nearly half the country can’t come up with $400 cash in an emergency. That’s stunning. The slightest mishap—a toothache, a minor car problem—will send them into debt or force them to sell something. This situation is the result of decades of stagnant wage growth. Since 1979, real (inflation-adjusted) hourly wages for the bottom quintile of earners fell by 1%. Worse, the inflation adjustment is based on the CPI, which as I’ve said many times, understates the real cost of living for most people. But wages haven’t stagnated for everybody. 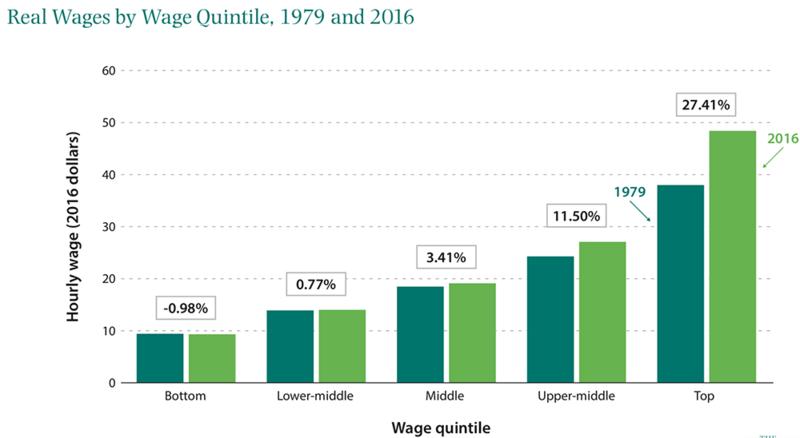 As the below chart shows, real hourly wages for the top quintile of earners have increased by over 27% in the same period. Income gains for the top 10% of the population rose roughly in line with that of the bottom 90% from 1930 to 1970. What happened in the 1970s to cause this divergence? The chief suspect is China’s opening to world trade and the onset of globalization. Over the past four decades, globalization has enabled the transfer of millions of jobs from the US to various emerging-market countries. It changed the relative value of capital and labor all over the world. The top earners started getting a larger share of their income from investments than from their labor. They own the “means of production,” and the producers did increasingly well from the ’70s forward. Nobody paid much attention to the unevenly distributed benefits of globalization, until around 40 million Americans lost their jobs in the 2007–2009 recession. Now, the backlash has begun, and it’s not going to stop until the situation improves for those who have been left behind. Globalization has lost its political support, and that raises an important question about the future of the global economy. If globalization has fallen out of favor with large swaths of the voting public, what does the future look like for the American-led order which has promoted economic liberalization and liberal values around the world since the end of WWII? This system, defined as the Liberal International Order, is the framework of rules, alliances, and institutions that is credited with the relative peace and prosperity the world has enjoyed since 1945. So, if the order has lost support, will the world plunge into beggar-thy-neighbor protectionism? Worse, without the threat of military intervention by the US and its allies, will regional powers start to challenge one another? One man answering these pressing questions is my good friend, Niall Ferguson. I’m sure most of you have heard of Niall, but for those who haven’t, it is my great pleasure to introduce him to you. Niall Ferguson is a senior fellow at Stanford University, and a senior fellow of the Center for European Studies at Harvard, where he served for twelve years as a professor of history. Niall is one of the finest economic historians on the planet; but he isn’t only an academic. What many people don’t know is that he works with a small group of elite hedge fund managers and executives as the managing director of macroeconomic and geopolitical advisory firm, Greenmantle. Before we dive in, I want to make clear that the goal of this letter is not to say whether liberal internationalism is good or bad, or defend the backlash against it. My objective is to highlight the current state of the order and give insight into Niall’s argument behind why he believes it is over. As investors, it is imperative we understand this trend because it has major implications for financial markets we need to think about. With that being said, let’s dive straight in. While the Liberal International Order and its institutions are credited with the relative peace the world has enjoyed since 1945, Niall says, “That's a very implausible argument.” He believes the world has been more peaceful because of the will and capacity of the US to be the principal guarantor of the system. This is often referred to as Pax Americana, in which the US employed its overwhelming military power to shape and direct global events. This reliance on US strength hasn’t been a problem for the past seven decades, but times are changing. Since the financial crisis, the US has been less willing to bear the costs needed to be the guarantor of the international order. Niall highlights the inaction over Russia’s annexation of Crimea in 2014, and the “little more than cosmetic” strikes against Syria as signs that the US is starting to take a more ambivalent approach to global conflicts. Without US willingness to use military power to establish balance across the world, it’s likely the liberal order will buckle under the unrestrained competition of regional powers. 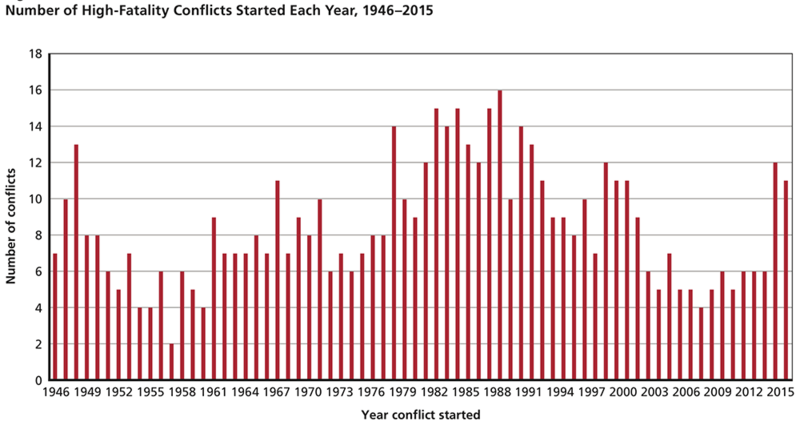 As the below chart shows, there has already been a sharp rise in the number of armed conflicts around the world. As Niall pointed out: “Things are becoming quite disorderly for the liberal order.” Before we go on, I want to make a critical point. Whether you support military intervention, or not, isn’t the issue here. The issue is that without the US playing the role of guarantor, we are likely to see a rise in conflicts. That is going to affect financial markets and your portfolio. The second “pillar” of the Liberal International Order, economic liberalization, is also under strain. Peak globalization is in the rearview mirror. Since peaking in 2007 and 2008, respectively, trade and foreign direct investment as a percentage of world GDP have fallen sharply. McKinsey Global Institute found that global flows of goods, finances, and services have declined by 15% since peaking in 2007. I believe “peak globalization” is in the rearview mirror. I say that not only because cross-border flows have declined precipitously, but because we are headed into a period of protectionism. US withdrawal from the Trans-Pacific Partnership is the most high-profile instance so far, but there are several more. The governments of Australia and Canada have taken measures to curb foreign ownership of real estate. New Zealand has taken this a step further by outright banning foreign ownership of real estate. In Europe, there have been several “behind the border” restrictions enacted by countries, which are designed to bolster domestic industries. Thus, it seems to me even the most liberal of countries are realizing globalization has overshot. This may not be the case going forward. Investors will have to pay a lot more attention to where the companies they choose to invest in operate, and where their sales come from. In short, protectionism is on the rise and investors must prepare accordingly. Longtime readers will know that I’m second to no one in defending free trade—but I also see the reality, which is that it has had a dark side. And that dark side is another symptom Niall has pointed to as proof that the International Liberal Order is over. I mentioned at the beginning of this letter that the benefits of globalization have been unevenly distributed. As the below chart shows, the big losers have been the American middle and working classes. Globalization has been bad for these sections of society because it changed the relative value of capital and labor. When capital and goods could flow freely between the US and emerging market countries, the value of labor in the US fell dramatically. Today, we are at a point where labor share of income has fallen to an all-time low of 57%. That means a growing fraction of the gains have been going to capital, and those who have it. The hardship experienced by millions of Americans has happened at a time when the wealthy have done increasingly well. Today, we have a situation where the top 0.1% of the population has roughly the same share of the US national wealth as the bottom 90%. Cue: the re-emergence of populism. It’s not a coincidence that populism emerged as a political force in both the 1920s–1930s, and again today. In each case, people at the bottom could tell the economy wasn’t working in their favor. The best tool they had to do something about it was the vote, so they elected FDR then, and Trump now. Two very different presidents, but both responsive to the most intensely angered voters of their eras. You only have to observe how the word “globalist” has become a slur to see that people have turned against liberal internationalism and those who support it. 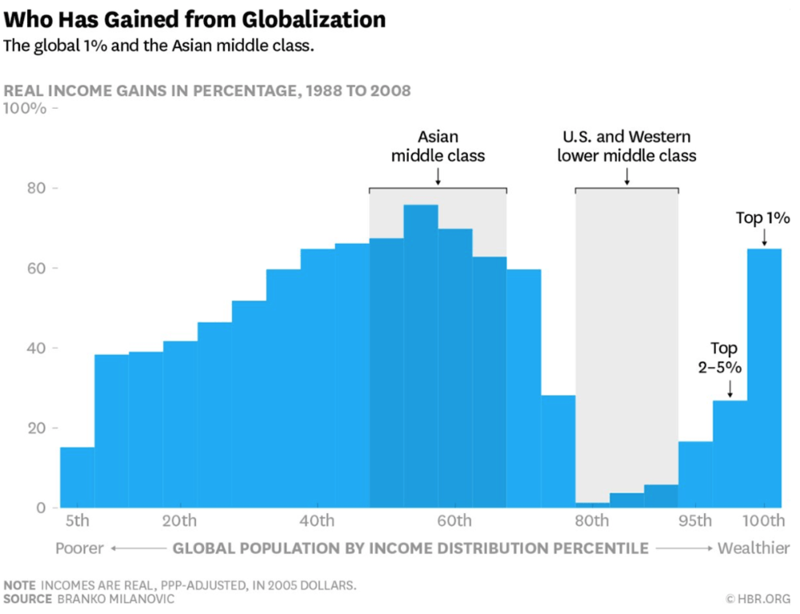 Globalization has been terrible for millions of middle- and working-class Americans, and they are very unlikely to vote for politicians who support it. By lowering the living standards for millions of Americans, the Liberal International Order has become the architect of their own downfall. Niall has also highlighted events taking place on the other side of the Atlantic as another sign that the Liberal International Order is indeed finished. Austria elected a 31-year-old, anti-immigration candidate as Chancellor. Italy’s populist Five-Star movement are leading in the polls for the general election, which takes place March 4. The Visegrad group, which consists of the governments of Poland, Hungary, Czech Republic, and Slovakia, have strongly opposed the resettlement of refugees and are battling with the EU over the issue. Angela Merkel did win the German elections, but four months later, she hasn’t been able to form a government because of the strong showing by the populist Alternative for Germany party. The empirical evidence supports Niall’s thesis, and so does the academic research. 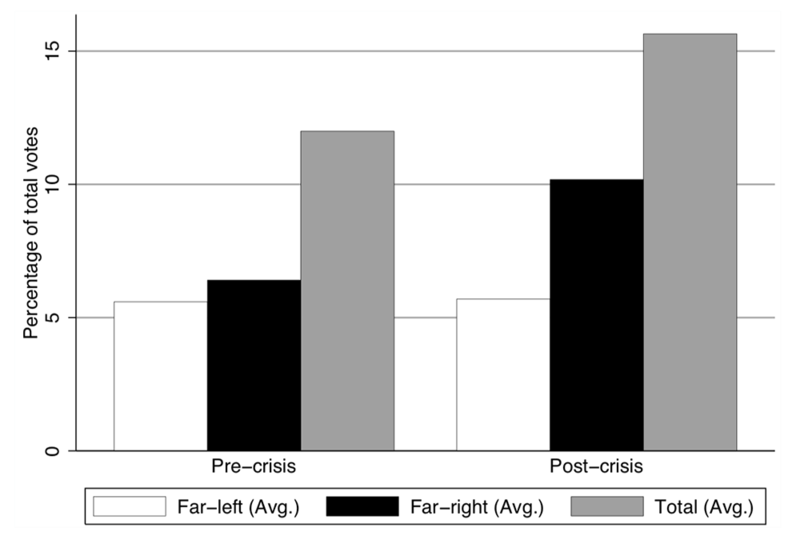 A 2017 study from the Brookings Institution found that there is a high correlation between jobs losses which occurred as a result of the financial crisis, and increased support for anti-establishment political parties in Europe. This is why I love talking with Niall. He makes sense of current trends by providing a historical perspective. Getting Niall’s insight not only allows you to understand what is currently happening, but how things are likely to unfold in the future. While the EU’s handling of the financial crisis hasn’t been good for business, I believe their mismanagement of the migrant crisis will prove to be their real downfall. According to Frontex, the EU border surveillance agency, over the course of 2015 and 2016, more than 2.3 million illegal crossings into Europe were detected. This influx of migrants hasn’t gone unnoticed. A recent survey by Paris-based think-tank, Fondapol, found that nearly two-thirds of EU citizens surveyed believe immigration has a negative impact on their countries. As the below chart shows, a similar percentage of respondents said they are “very worried/worried” about Islam. Despite the concerns of people all across Europe about immigration, EU officials continue to push refugee resettlement on member states. The EU’s actions in the face of these concerns proves that there is a complete disconnect between those in Brussels and ordinary Europeans. I can’t see how this doesn’t cause a further increase in support for populism around Europe, and ultimately lead to the demise of the EU—which would certainly prove that the Liberal International Order is over. To be clear, I don’t think the collapse of the EU is imminent, but it is certainty on a downward trajectory. We saw this movie before, will it have the same ending? I’m not sure if the Liberal International Order will end in war, but the current state of affairs can’t last much longer. Globalization has jumped the shark, and as a result, we are seeing a powerful backlash from those who have been hurt by it. There is no way to predict how this situation will unfold. But I know that I want to be the first to hear about any developments, because they have serious implications for financial markets and the societies we live in. I have so many questions I want to ask Niall about this trend and many others. That’s why I’ve invited him back to give a keynote speech at my Strategic Investment Conference in San Diego this March. Niall last spoke at my conference two years ago. He was bullish on the global economy at a time when almost everybody—including me—was bearish. I really don’t know what Niall is thinking about right now, or what new insights he has in store for SIC attendees. I am truly excited to welcome him back and I hope you can be there with me to experience it, first-hand. If you would like to learn more about attending the SIC 2018, and about the other speakers who will be there, you can do so here. “I told my sister about the conference and why I was going. She said, "Of course! Not going would be like standing around and missing 1968 in San Francisco." That concludes the fifth and final installment in this series. I hope you have enjoyed reading my insights into these “big ideas” as much as I have enjoyed writing them. Although it’s over, I do have something special to send you in the coming days. It’s a personal video message that I just finished recording. Think of it as a stepping stone to taking these “big ideas” to the next level. I’ll tell you more about it in my series recap email, tomorrow. ALMOST one year into Donald Trump’s presidency, you have to pinch yourself to make sense of it all. 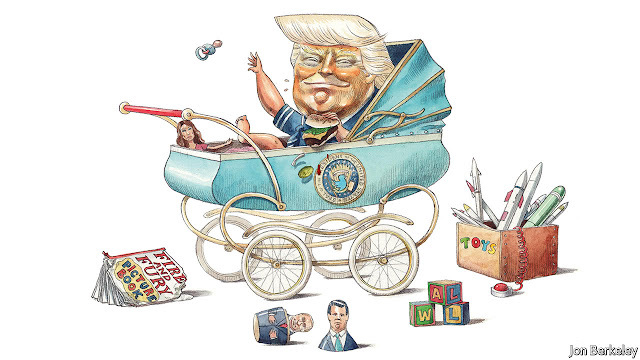 In “Fire and Fury”, Michael Wolff’s gossipy tale of the White House, which did not welcome Mr Trump’s anniversary so much as punch it in the face, the leader of the free world is portrayed as a monstrously selfish toddler-emperor seen by his own staff as unfit for office. America is caught up in a debate about the president’s sanity. Seemingly unable to contain himself, Mr Trump fans the flames by taking to Twitter to crow about his “very stable genius” and, in a threat to North Korea, to boast about the impressive size of his nuclear button. Trump-watching is compulsive—who hasn’t waited guiltily for the next tweet with horrified anticipation? Given how much rests on the man’s shoulders, and how ill-suited he is to the presidency, the focus on Mr Trump’s character is both reasonable and necessary. But, as a record of his presidency so far, it is also incomplete and a dangerous distraction. To see why it is incomplete, consider first that the American economy is in fine fettle, growing by an annualised 3.2% in the third quarter. Blue-collar wage growth is outstripping the rest of the economy. Since Barack Obama left, unemployment has continued to fall and the stockmarket to climb. Mr Trump is lucky—the world economy is enjoying its strongest synchronised upswing since 2010. But he has made his luck by convincing corporate America that he is on its side. For many Americans, especially those disillusioned with Washington, a jeremiad over the imminent threat to all of America from Mr Trump simply does not ring true. Despite his grenade-throwing campaign, Mr Trump has not carried out his worst threats. As a candidate he spoke about slapping 45% tariffs on all Chinese goods and rewriting or ditching the North American Free-Trade Agreement with Canada and Mexico. There may soon be trouble on both those fronts, but not on that original scale (see article). He also branded NATO as obsolete and proposed the mass deportation of 11m illegal immigrants. So far, however, the Western alliance holds and the level of deportations in the 12 months to September 2017 was not strikingly different from earlier years. In office Mr Trump’s legislative accomplishments have been modest, and mixed. A tax reform that cut rates and simplified some of the rules was also regressive and unfunded. His antipathy to regulation has invigorated animal spirits, but at an unknown cost to the environment and human health. His proposed withdrawal from the Paris climate agreement and the fledgling Trans-Pacific Partnership was, in our view, foolish, but hardly beyond the pale of Republican thinking. The danger of the Trump character obsession is that it distracts from deeper changes in America’s system of government. The bureaucracy is so understaffed that it is relying on industry hacks to draft policy. They have shaped deregulation and written clauses into the tax bill that pass costs from shareholders to society. Because Senate Republicans confirmed so few judges in Mr Obama’s last two years, Mr Trump is moving the judiciary dramatically to the right (see article). And non-stop outrage also drowns out Washington’s problem: the power of the swamp and its disconnection from ordinary voters. As we have written repeatedly over the past year, Mr Trump is a deeply flawed man without the judgment or temperament to lead a great country. America is being damaged by his presidency. But, after a certain point, raking over his unfitness becomes an exercise in wish-fulfilment, because the subtext is so often the desire for his early removal from office. For the time being that is a fantasy. The Mueller probe into his campaign’s dealings with Russia should run its course. Only then can America hope to gauge whether his conduct meets the test for impeachment. Ousting Mr Trump via the 25th Amendment, as some favour, would be even harder. The type of incapacity its authors had in mind was a comatose John F. Kennedy had he survived his assassination. Mr Trump’s mental state is impossible to diagnose from afar, but he does not appear to be any madder than he was when the voters chose him over Hillary Clinton. Unless he can no longer recognise himself in the mirror (which, in Mr Trump’s case, would surely be one of the last powers to fade) neither his cabinet nor Congress will vote him out. Neither should they. Alarm at Mr Trump’s vandalism to the dignity and norms of the presidency cuts both ways. Were it easy for a group of Washington insiders to remove a president using the 25th Amendment, American democracy would swerve towards oligarchy. The rush to condemn, or exonerate, Mr Trump before Mr Mueller finishes his inquiry politicises justice. Each time Mr Trump’s critics put their aim of stopping him before their means of doing so, they feed partisanship and help set a precedent that will someday be used against a good president fighting a worthy but unpopular cause. That logic holds for North Korea, too. Mr Trump is not the first president to raise questions about who is fit to control nuclear weapons—consider Richard Nixon’s drinking or Kennedy’s reliance on painkillers, anti-anxiety drugs and, during the Cuban Missile Crisis, an antipsychotic. Ousting Mr Trump on the gut feeling that he might be mentally unstable smacks of a coup. Would you then remove a hawk for being trigger-happy or an evangelical for believing in the Rapture? Mr Trump has been a poor president in his first year. In his second he may cause America grave damage. But the presidential telenovela is a diversion. He and his administration need to be held properly to account for what they actually do. For Citigroup, the past few weeks have not exactly been kind. Just before Christmas, the US bank had to shell out $11.5m over a faulty data feed that caused its brokers to mislead retail customers about what analysts thought of specific stocks. For four solid years, Citi’s computer system spat out inaccurate or incomplete information on 1,800 stocks to its salespeople. In the worst cases, Citi brokers told investors that companies were rated “buy” when in fact they were considered “sell”. A week later, the Office of the Comptroller of the Currency hit Citi with a $70m penalty for a completely different issue. It said the bank had failed to fix problems with its anti money laundering programmes, despite signing a consent order promising to do so back in 2012. The bank says it is precluded from discussing details, but Citi’s AML processes still are not up to scratch today. To make matters worse, the bank’s leaders have also estimated that its profits will take a $20bn hit from new US tax law when it announces results next week — far more than most of its Wall Street competitors. As enforcement cases go, the two recent ones are small potatoes. The fines are tiny when compared with the billions of dollars big banks have shelled out for rigging interbank lending rates and foreign exchange benchmarks. And the actual harm done is strictly limited. The analyst case brought by Finra, the industry regulator, includes $6m in customer compensation for mis-sold shares, and the real cost may be lower. The OCC case, meanwhile, does not include any allegations that actual money laundering occurred. But Citi’s latest fine comes just eight months after it paid $100m and admitted to criminal violations for “wilfully” failing to maintain proper controls over international transfers between Mexico and one of its California-based subsidiaries, Banamex USA. Similarly, the error-filled research feed comes against a backdrop of other small Finra fines. A review of the regulator’s Brokercheck system finds that Citigroup Global Markets had 20 enforcement actions last year, compared with 10 for Goldman Sachs and 13 for Bank of America’s Merrill Lynch arm. Taken together, the recent string of problems calls into question the bank’s ability to get basic control issues right. That is no small concern, given that Citi required a $45bn taxpayer bailout during the 2008 financial crisis and failed the US Federal Reserve stress tests as recently as 2014. In some ways it is unfair to single out Citi. Over the past few years, the OCC has also fined JPMorgan Chase and HSBC for failing to live up to the terms of past consent orders. And the $20bn hit to profits is largely an accounting issue: Citi’s results have long factored in plans to use its huge losses from the crisis to reduce the taxes it has to pay on future earnings. Now that corporate tax rates are going to be lower, the value of that deduction has dropped significantly. Citigroup has come a long way since the dark days of 2008 or even 2014. The bank passed the 2016 tests with flying colours, and in July it set out a plan to return $60bn to shareholders in dividends and share buybacks over the next three years. In another important milestone, Citi was the first of the really big US banks to win regulatory approval of its so-called living will, the plan that shows how it could be wound up in a crisis without requiring taxpayer support. But the flurry of small issues comes at a critical time for big US banks. After nearly a decade of providing rigorous oversight, the US bank and market watchdogs are dramatically paring back. President Donald Trump’s appointees at the Federal Reserve, Securities and Exchange Commission and elsewhere have made clear that they believe financial groups should be given more freedom to take risks to help the economy grow and to police themselves. The Fed is considering conducting stress tests every two years, the SEC is reining in the issuance of subpoenas used to build enforcement cases, and Mr Trump has moved to defang the Consumer Financial Protection Bureau, which looks after retail customers harmed by banks. Such shifts are common when a Republican president succeeds a Democrat. Historically, risk-taking shoots up and investment in compliance goes down. Given how much has been spent in recent years, many banking executives see that as a healthy correction and a welcome boost to their bottom lines. But consumer groups and industry critics, who remember that the last big regulatory relaxation was followed by the financial crisis, are far less sanguine. If banks like Citi are still getting the little stuff wrong after a decade of investment, what is going to happen if they stop feeling pressure to invest? Maybe this is a time when investors should be sweating the small stuff. Walmart made two announcements yesterday that perfectly illustrate the dilemma facing the developed world. (WGNO) – Walmart is raising its minimum wage and handing out tax cut bonuses because of the new Republican tax law. The bonus amount will be based on length of service, according to the company. Workers who’ve been there for at least 20 years will get the full $1,000. The company, which is the nation’s largest private-sector employer, said it’s also expanding its parental and maternity leave policy. Full-time hourly workers in the United States will get 10 weeks of paid maternity leave and six weeks of paid parental leave. “Thanks to the passage of historic tax cuts, American workers and their families are winning!” tweeted Ivanka Trump, the White House senior adviser and daughter of President Trump. (UPI) – Walmart announced Thursday it is closing 63 Sam’s Club stores across the United States, leaving workers at the membership club without Jobs. Ten locations for the warehouse club spinoff of Walmart closed immediately and will become e-commerce distribution centers, according to Business Insider, which listed store closings it knows about. The remaining places will remain open for a few weeks. “After a thorough review of our existing portfolio, we’ve decided to close a series of clubs and better align our locations with our strategy,” Sam’s Club posted on Twitter. Employees in some cases were informed of the closings while arriving to work Thursday, KHOU-TV in Houston and KENS-TV in San Antonio reported. “Club is closed today so we could inform our associates so we gave them the day off and closed the club. We will reopen the club tomorrow,” Anne Hatfield, director of communications for Walmart’s public affairs, said in a statement to KENS. At one Sam’s Club in San Antonio, employees told KENS the store will close for good on Jan. 26. On Friday, it will offer 25 percent off on everything except for alcohol, tobacco, batteries and tires. Sam’s Club, which has 100,000 associates, operates more than 650 membership warehouse clubs in the United States, according to its website. The first Sam’s Club, founded by Sam Walton, opened on April 7, 1983, in Midwest, Okla. There are two problems here: First, rising wages increase the “wage inflation” measure that the Federal Reserve watches to decide whether inflation is becoming a problem and needs to be smacked down with higher interest rates. See Walmart wage hike may show wage pressures building for lowest paid. The eventual result of rising interest rates in the late stages of an expansion is a recession in which millions of people are thrown out of work, thus canceling the minimum wage boost. The second, much bigger problem is that next-gen automation becomes more attractive when wages rise. Walmart converting Sam’s Clubs to regional ecommerce distribution centers is, in effect, replacing store clerks with warehouse robots and a relative handful of website designers. To the extent that wages rise, so do automation-related layoffs, once again cancelling out those higher paychecks. Automation has of course been around since the start of the industrial revolution, but this latest phase is vastly more pervasive and powerful than anything that’s come before. The result: Life gets better for those who own the robots and harder for those the robots replace. And government encourages the 99% to borrow to make up the difference, until that trend also hits a wall. In late December, Iran was hit by a wave of protests. Demonstrators from many segments of society, including students and middle- and lower-class citizens, demanded the government do something about rising food prices. The protests started in a major city in the northeast but soon spread to dozens of towns, villages and urban centers throughout the country. They were the largest demonstrations since 2009, when more than a million people poured into the streets of Tehran to protest the presidential election results. The recent demonstrations are smaller but more widely dispersed than those in 2009. Iran is, however, in a different position now than it was roughly 10 years ago. The country has emerged from the Syrian civil war in arguably the best position out of all the powers in the region. In Iraq, the state security forces and the Popular Mobilization Forces – a coalition of mostly Shiite militias – are largely under Iranian control. In Syria, the regime of President Bashar Assad, an Iranian ally, is still intact, partly due to Iranian support. In Lebanon, Tehran maintains substantial power through its proxy group Hezbollah. And in Yemen, the Iranian-backed Houthi rebels continue to threaten the Saudi-led coalition. Still, the protests that began just two weeks ago had some observers questioning whether the regime was facing a serious threat. But the country has withstood large-scale protests before. In 1999, Iran experienced widespread student demonstrations after the closure of a reformist newspaper. Ten years prior, the death of the founder of the Islamic Republic, Ayatollah Ruholla Khomenei, led to a split between moderate conservatives and hard-line clerics – a split that is the foundation of some of the instability the country has seen since. This Deep Dive will explore what’s driving the current bout of unrest. It will compare these protests with three previous episodes of unrest the country experienced in the past four decades and examine what the demonstrations could mean for the regime and the country’s role in the región. The current protests began on Dec. 28 in Iran’s second-most populous city, Mashhad, situated in the northeast near the border with Turkmenistan. On the first day, three cities held demonstrations. (Some reports say it was five.) On the second day, an additional nine cities saw protests. By the sixth day, the protests had spread to all corners of the country, from the capital to small towns and villages with only tens of thousands of residents. Initially, the protests seemed to be focused on economic concerns, namely, the sharp increase in prices of two food staples: poultry and eggs. While inflation rates have declined in Iran over the past five years, from roughly 45 percent to 10 percent, a rapid decline in poultry supplies due to the culling of more than 15 million birds over avian flu fears and an increase in the cost of imported feed led to a 40 percent increase in the price of poultry and eggs. But within days of the initial protests, the demonstrations turned political, with protesters chanting anti-regime slogans such as “death to Khamenei,” “the Khamenei’s regime is illegitimate” and “free political prisoners.” President Hassan Rouhani delivered a speech acknowledging people’s grievances but stating that “violence and damage to public property” would not be tolerated. Ayatollah Ali Khamenei, the supreme leader of Iran, also gave a rare speech, accusing outsiders of instigating the uprising. At first, the government was hesitant to respond with force to protests over food prices. But as the protests continued, police began to crack down. Estimates on the number of protesters at each rally range from 100 to thousands, while nationwide the demonstrations drew tens of thousands. Gen. Mohammad Ali Jafari, commander of Iran’s Revolutionary Guard, said that by Jan. 3, approximately 15,000 people participated across the country. This figure does not include the pro-government protests organized by the regime that took place at the same time. The government has claimed that 22 people were killed in the protests nationwide, while the opposition claims that 50 people died. But a brief look at the past 40 years of Iranian history shows that the recent protests are not unprecedented. The Islamic Republic, after all, was founded after an uprising that began in 1978 and caught the Shah of Iran and his extensive security apparatus off guard. A deteriorating economic environment marked by austerity, inflation and inequality, combined with unpopular land reform policies and top-down Westernization initiatives, made strange bedfellows of an array of groups from all levels of society. The result was widespread unrest, and by early 1979, security forces were refusing to crack down on the protests. The Shah went into exile and Ayatollah Ruholla Khomenei became the country’s first supreme leader. Iran’s first post-1979 uprising began forming in 1997, when the reformists, led by Mohammad Khatami, captured control of both the presidency and the parliament. The new government eased restrictions and introduced some social reforms. In 1999, the shutdown of a reformist newspaper by a hard-line court triggered a week of mass protests in Tehran and other university cities by supporters of Khatami, most of them students and underemployed urban youths. The restructured security forces – still largely under the control of conservative clerics who also form part of the government – including a sprawling new volunteer paramilitary force called the Basij, responded decisively, arresting an estimated 1,500 demonstrators, killing as many as 17, and injuring thousands more. This uprising essentially marked the first instance of public backlash against the clerical establishment since the founding of the Islamic Republic. By this point, the tension between the religious leadership and the country’s democratic institutions was clear. The same internal tensions came to the fore once again during the 2009 Green Movement, following ultraconservative President Mahmoud Ahmadinejad’s fraud-marred re-election. Beginning in the late 1980s, Khamenei, who lacked the devoted following of his predecessor, built a base of support by empowering the security apparatus to take on a greater role in political and economic affairs, overturning a ban on political activities Khomeini had placed on groups like the Revolutionary Guard. Ahmadinejad’s ascent to the presidency in 2005 marked the rise of a political alliance between hard-liners and the security establishment, giving greater control over the Iranian government to the Revolutionary Guard. The 2009 election race between Ahmadinejad and reformist former Prime Minister Mir Hossein Mousavi, a Khatami acolyte, generated Iran’s highest-ever voter turnout. And when it was announced that Ahmadinejad had been re-elected with more than 60 percent of the vote (winning many districts with 100 percent support), the protests that followed were Iran’s largest and longest since 1979. As many as 3 million Iranians took to the streets over the next seven months to demand the result be overturned. For the first time since 1979, chants denouncing the supreme leader, who had signed off on the election result and was seen as condoning the violence waged by the Revolutionary Guard and the Basij, were widespread. But the protests never gained much traction in the smaller cities and largely rural areas where Ahmadinejad was most popular. And the ruthlessness of the crackdowns – employing around 20,000 members of a special unit of Iran’s police force as well as the Basij militia – left the movement divided. It petered out in February 2011. There are a number of similarities between each of Iran’s major uprisings. First, each of the major protest movements gained traction during periods of heightened economic stress. Second, all were fueled by widespread perceptions that the ruling class (whether under the Shah or the clerics) had become sclerotic, corrupt and self-serving, breeding a sense of alienation and inequality. Third, each movement was exacerbated, in part, by specific moves to suppress the political opposition. Finally, all escalated in size and intensity after initial crackdowns. Only one of the three previous protest movements – the 1979 revolution – resulted in a change in government. This can be attributed to two factors: the demographic makeup of the protests during the revolution and the failures of the security apparatus. None of the post-1979 uprisings involved nearly the same breadth of disaffected segments of society as were involved in the Islamic Revolution. By 1978, an unlikely alliance was forming between opposing sides of Iran’s myriad ethnic, regional and socio-economic groupings, leaving the Shah’s regime without a substantial base of support to use as a bulwark. But in both 1999 and 2009, the uprisings did not manage to bridge these divides. The bulk of the protesters in 1999 were students and underemployed urban youths, in addition to supporters of Khatami. The 2009 Green Movement had a similar demographic makeup. It never gained much traction beyond urban supporters of the opposition. In both 1999 and 2009, the core base of support for the clerical regime – the rural, the religious and the hard-liners – largely stayed on the sidelines and at times held counter-protests. The 2009 uprising was also supported by a number of people outside Iran, who presented the unrest as more significant than it actually was. The most recent protests included demographic elements from the clerical regime’s traditional base. But as urban, middle-class moderates – who are more insulated from the country’s economic woes than rural, lower-class protesters, and who would be wary of seeing a relative moderate like Rouhani replaced by a hard-liner – have largely remained on the sidelines, the protests have been smaller and less diverse than those of 1979. This might explain why the regime didn’t seem too alarmed by the demonstrations this time around. The other factor that forced the Shah from power was that his security apparatus crumbled. The military and the Shah’s CIA-trained secret police, SAVAK, were well-funded and had successfully dismantled opposition and guerrilla movements prior to 1978. But SAVAK was smaller than its modern counterparts. (Estimates vary wildly, from 5,000 to 60,000 at its peak, compared to up to 150,000 for the Revolutionary Guard today.) Perhaps more problematic, unlike the security apparatus currently underpinning the Islamic Republic, neither the military nor SAVAK were structured in a way that may have made it possible for the Shah to exploit Iran’s internal fractures in order to stay in power. Both were modeled after the Shah’s vision for Iran as a secular, Westernized country that had moved past its internal cleavages. Recruitment, for example, was open to all segments of Iranian society. That meant the forces were beset with many of the same internal divides, and thus more brittle. They were willing to crack down on narrow protest movements led by fringe elements, but when faced with a ballooning protest movement that reflected its pan-Iranian demographic makeup, a critical mass of the forces laid down their guns. From the start, Khomeini and the clerical regime knew that the country’s security forces would need to be restructured to be more cohesive and ideological to prevent the regime from being toppled in the same way they just took power. Thus, atop Iran’s conventional military and police forces, the clerical regime built a vast new security apparatus to cement the inchoate revolution and ensure that a complex web of people would always be looking over the shoulders of anyone who might challenge the new regime’s authority. At the system’s heart are two forces: the Islamic Revolutionary Guard Corps and the Basij. The 100,000-150,000-strong Revolutionary Guard is substantially larger than SAVAK and is tightly ideologically aligned with the Islamic regime. Early on, the Revolutionary Guard was filled with fervent supporters of the new republic and remains beholden to the clerics. Over time, it has been allowed to expand its political and economic involvement and sway over Iran’s foreign affairs, particularly under Ahmadinejad, giving it deep-rooted interests in ensuring the survival of the clerical regime. The Revolutionary Guard has increasingly become involved in managing state-owned companies and projects, further benefiting from the alleviation of sanctions, more so than most of the rest of the population. In other words, it has the self-interest, mandate and ability to ensure that it will reliably crack down on the opposition when called upon to do so. The roughly 1 million-strong Basij is effectively the glue that keeps the regime from crumbling when facing grassroots unrest. Founded in 1979 but placed under the purview of the Revolutionary Guard shortly thereafter, the Basij are more widely diffused throughout the country, more informally structured and more ideologically aligned with the hard-line conservatives in the regime than anything the Shah ever had at his disposal. The force is demographically homogeneous, with volunteer members recruited primarily from the Iranian heartland, ensuring a relatively high degree of cohesion and perhaps greater willingness to suppress, for example, the Westernized protesters it deems to be on the wrong side of Iran’s urban-rural divide. Plainclothes Basij operatives are known for infiltrating protests to stir up chaos, sour public opinion of protest movements and conduct extreme acts of violence intended to demoralize the protesters. To sustain public support, Basij units are embedded deeply in the everyday life of the towns where they are based, taking part in public works projects and underscoring the regime’s legitimacy as the guardian of Islamic principles. This also allows the force to serve as an early warning function for the regime, detecting potential sources of unrest bubbling up in remote areas of Iran. Whereas the Shah relied on a highly centralized security apparatus, the Basij give the current regime a highly decentralized, largely autonomous tool with which to detect and respond quickly to emerging threats to the regime. In short, since 1979, Iran hasn’t faced the same kind of broad uprising that felled the Shah, and Iran’s rulers have developed a much larger security apparatus that is less likely to split along the cleavages being exposed by mass protests. As a result, the subsequent protest waves, including the most recent, have failed to bring about regime change. Ultimately, so long as the regime and the security forces remain tightly aligned, the Islamic Republic can withstand mass unrest. But the current round of protests has raised a key question: What happens to the regime’s suppressive capabilities if Iran’s myriad political divisions spread to its security apparatus? And what would happen if control over the security forces becomes contested amid deepening splits within the clerical regime that were exposed by the 1999 and 2009 uprisings? With the current wave of protests emanating primarily from bastions of support for the regime – and that of the security forces – the new uprising has laid bare an internal weakness inside the Islamic Republic. And in many ways, the regime in its current form is at an impasse where its existing structures are increasingly unable to placate the citizenry. It will have to evolve, and this will entail a messy process in the years to come. The Islamic Republic of Iran is not your average dictatorial regime. Rather, it is an odd amalgamation of Shiite Islamist theocracy and Western parliamentary democracy that blends traditional Islamic law and modern parliamentary processes. At its apex is the supreme leader, who is selected by a body known as the Assembly of Experts composed of 86 clerics. The supreme leader appoints the judiciary and, more important, the Guardian Council, which is also made up of clerics and has the power to veto legislation and vet candidates for public office, including the president. On paper, at least, the supreme leader also controls the Revolutionary Guard. The Supreme National Security Council includes the leaders of nearly every major branch of government and the security forces; its decisions must be made collectively and require sign-off from the supreme leader. Meanwhile, the public elects the president every four years, as well as the parliament, whose membership includes clerics but also representatives from all segments of society, including women. The public also elects the Assembly of Experts, though all candidates must be clerics. High-profile instances of fraud notwithstanding, elections are generally considered to be legitimate, though the Guardian Council does influence the outcome. This system functions via a maze of institutional structures that is designed, in part, to keep the various factions and power centers in balance and subservient to the supreme leader. On balance, the hard-line conservative clerics hold the most power in this system, but they are not omnipotent as is often portrayed. If they were, they would not have allowed reformists like Mousavi or Rouhani to run for president in 2009 and 2013, respectively. In reality, no one really has unchecked freedom of action – the clerics or otherwise. The Revolutionary Guard derives its legitimacy from the clerics, who derive legitimacy from the constitution – the republican center. None of them can act alone. Iran’s blend of Islamism and republicanism means conflict is woven into the fabric of the clerical regime. This blend has shown itself primarily during election campaigns, when one camp privileges clerical oversight and the other emphasizes popularly elected government. The recent pattern of protests is merely an outgrowth of this perpetual push and pull. The government may have no qualms about suppressing political dissent, but it will also be willing to make modest political or economic concessions afterward to release some pressure. From this perspective, the protests are once again a demonstration of the system’s resilience, not its vulnerability. But the domestic political landscape is no longer a function of the old partisan structures. The Ahmadinejad and Rouhani presidencies have led to a further fragmentation of the conservative camp. Meanwhile, the reformists are also divided and do not command the leadership of the public, a good chunk of which is seeking substantive political and economic change. Similar divides exist even within the Revolutionary Guard, as many commanders support the reformist and centrist camps, despite recent moves by Rouhani’s government to rein in the Revolutionary Guard’s business interests in sectors ranging from energy to mining to telecommunications. As a result, the political establishment is, now more than ever, a collection of power centers and factions, making the regime and its security forces increasingly prone to infighting, impasse and paralysis in a crisis. This is particularly problematic because Ayatollah Khamenei is now 78, meaning a fight is looming over the selection of the next supreme leader. Whatever his own constraints on action, Khamenei is the unmatched source of regime legitimacy with religious conservatives and is uniquely empowered to balance factions, break impasses and keep the security apparatus in check. His death may open up a renewed scramble for control over Iran’s future if it further divides the clerical establishment and, therefore, control of the security forces. The recent protests indicate that Iran’s leaders are willing to admit that the country faces legitimate economic problems. The regime, however, doesn’t have many options, and the one option it does have will almost certainly decrease its ability to spend money on foreign adventures. The crux of Iran’s economic and domestic political challenges is that the country needs more jobs. Unemployment remains high despite positive economic growth generated by the Iran nuclear deal and the lifting of sanctions. In Iran, the biggest hurdle to creating jobs is a lack of investment. Investment can come from either international or domestic sources, but both come with their own challenges. The long-standing sanctions regime has made it difficult for Iran to attract international investment. Tehran signed the nuclear deal because it was supposed to lift these sanctions, assimilate Iran into the international financial community and clear the way for greater capital inflows into the country. Rouhani staked his second presidential term on this premise. This was not, however, universally seen as a positive move. Many hard-line conservatives opposed the deal, but the promise of jobs was sufficiently popular that Rouhani won his second term in a landslide. The nuclear deal, however, exacerbated rather than healed rifts between the reformist and conservative factions. What’s more, the deal hasn’t worked as Rouhani planned. There has been growth, but it has primarily been driven by more oil sales, the profits of which are held by a small minority in the government and security apparatus, including the Revolutionary Guard, which controls several of the country’s state-owned oil companies. Economic growth has not been distributed equally. Some of the protesters even said that the deal has benefited only a few people in the state. The agreement did seem to attract new foreign direct investment in 2016. Iran approved $11.8 billion in FDI projects, a six-fold increase over the previous year, and $3.4 billion in foreign capital was actually invested, a 64 percent increase over 2015 levels. It is unsurprising that the regime would first provide economic benefits to the Revolutionary Guard, the entity responsible for maintaining its own security. But the regime has failed to deliver benefits to a broader segment of society, and the subsequent protests increase uncertainty in the eyes of potential international investors. With the deal increasingly called into question by both the U.S. and factions within Iran, and with sanctions unrelated to the nuclear deal still in place, outside investors are understandably hesitant to spend money in the country. It’s unlikely, with this degree of uncertainty, that Iran can expect to see the full extent of the capital inflow it was hoping for. To spur greater investment, it must therefore rely on domestic sources. There are two potential sources of domestic investment: private and public. One way to increase private investment is to make it cheaper to access capital – that is, to decrease interest rates. But this isn’t an option for Iran. Interest rates are high right now – the benchmark rate sits at 18 percent – in part because the government has been fighting inflation. While inflation is still high – about 10 percent – five years ago it was even higher – closer to 45 percent. Lowering interest rates would risk raising inflation again, as well as weakening the Iranian rial, the country’s currency, which has already declined relative to the dollar from about 25,000 rial per dollar in 2014 to about 36,000 today. If the rial becomes devalued, then imports will become even costlier. And the government wants to avoid spikes in prices for consumer goods. It was, after all, the high cost of imported grain feed that spurred the most recent protests. Further, Iranian banks are stretched thin. In addition to already having extended quite a lot of credit – and, as a result, operating with relatively low capital reserves – there is also an abundance of nonperforming loans in the banking system. Offering more credit and further depleting bank reserves would greatly risk the stability of Iran’s financial system. For these reasons, raising investment through domestic private capital is not a great option either. The last source of investment, then, is domestic public capital (i.e. government spending). If the government were to spend more on business investment, however, it would have to spend less on other things like defense and social services, a potentially dangerous move. The 2018 budget released in early December, just weeks before the protests erupted, showed that the government planned to decrease the number of people receiving cash subsidies by 45 percent. (Nearly 95 percent of Iranians receive some form of cash subsidy.) The government claims it will divert some of these funds to encouraging production, which could lead to job creation. (The government claimed it will create 634,000 new jobs in 2018.) But even if this strategy works perfectly – and they rarely do – there will still be a gap between the time that people lose their subsidies and the time that new jobs actually become available. In addition, the 2018 budget increases defense spending by 20 percent to about $11 billion, of which $8 billion is allocated to the Revolutionary Guard. So while the people are receiving fewer subsidies, the security and intelligence establishment is getting a boost, not only from increased oil sales, but also from increased public funds allocated to them by the government. The nationwide uprising has forced the government to consider shifting its cuts to defense spending rather than social subsidies. This, of course, is a risky prospect considering the Revolutionary Guard’s involvement in the country’s political and economic affairs, as well as its role in carrying out the country’s imperative abroad and ensuring the regime’s survival at home. It seems the protests have been, for now, fairly well-contained by the regime. Nevertheless, the regime is now aware that its prior attempts to fix the country’s economic problems have been unsuccessful, and it will therefore need to consider allocating a greater portion of the public budget to investment in the economy and measures that could encourage job growth. The broader consequence of this development is that it could force Iran to reconsider some of its objectives abroad. With operations in Yemen, Syria and elsewhere, it may be finding that it is overstretched and that its efforts, and its money, would be better used maintaining stability at home rather than pursuing ambitions throughout the Middle East.